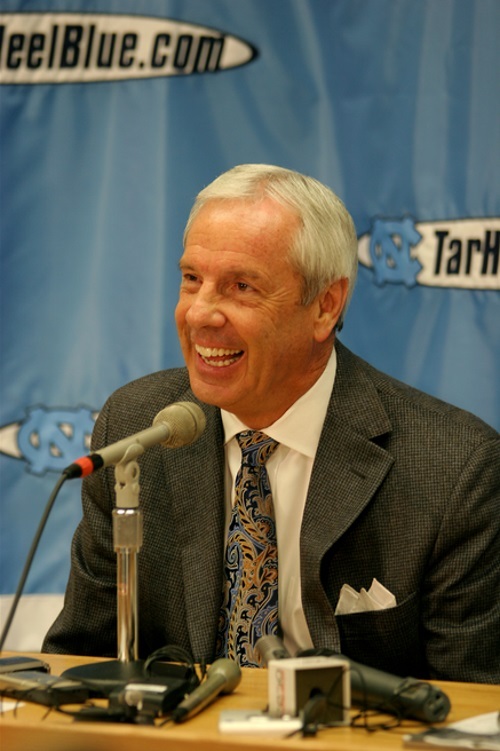 Roy Williams and his North Carolina Tar Heels ended the men's college basketball season without the national championship, or even an Ear of Corn. But they do get our nod as Team of the Year (Zeke Smith/Creative Commons Attritbution-Share Alike 2.0 Generic license). Villanova now holds the postseason Ear of Corn with its buzzer-beating, 77-74 win against North Carolina in the NCAA Championship game. But the Tar Heels remain the Team Supreme for the 2015-16 season in the chase for this prize, the only known traveling championship to encompass both the regular season and the postseason in men's college basketball. Virginia Tech took the regular season Ear to Washington DC for the prize's first postseason event, the Atlantic Coast Conference (ACC) Tournament, the league tournament that awarded automatic bids before other conferences even had tournaments. Appropriate, maybe. 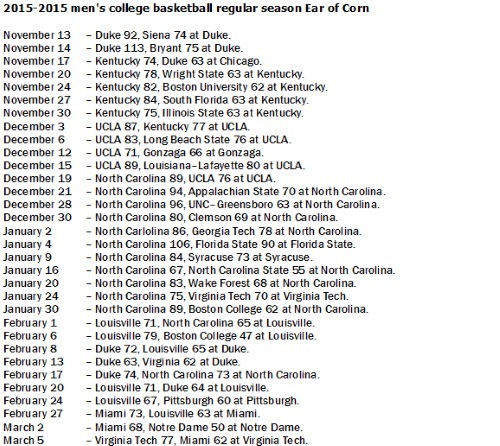 Once the tournament began, the Ear of Corn got around. Virginia Tech defended it once, a 96-85 win over Florida State in the first round. Round 2, the Hokies lost to Miami, 88-82. But Miami wasn't long for the prize, falling, 73-67, to Virginia in the tournament semifinal. And on that Sunday of selection, North Carolina won the ACC Tournament and pried back the Ear of Corn, beating Virginia, 61-57, and taking it to the NCAA Tournament. The Tar Heels defended the title just as they defended it during the regular season – maybe for a shorter time, but it is the NCAA Tournament. During their run, the Heels dispatched Florida Gulf Coast, Providence, Indiana, Notre Dame and Syracuse, none of which came within 13 points. But the Tar Heels couldn't take it all the way to the end. At the championship buzzer, the postseason prize went to Villanova and that true shot by Kris Jenkins.